We're leaving tomorrow for a week's vacation, and I just thought I'd make a short post about what we're bringing to read! - Hattie Big Sky, by Kirby Larson - my 10 year old daughter is in the middle of listening to this. 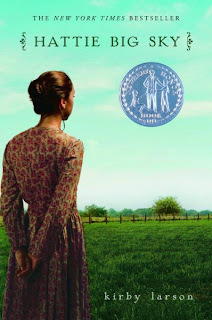 It's about a sixteen year old girl in Iowa whose an orphan and one day she receives a letter saying she has inherited a homestead in rural Montana. She decides to take the train and try to make a home in this new place. I asked my daughter what she thought helped Hattie get through the really hard times, and my daughter said that it was her friends. - Under the Jolly Roger, by L.A. Meyer - from Audible.com - my 10 year old has devoured the first two in the Bloody Jack series - and so this is a treat for her. 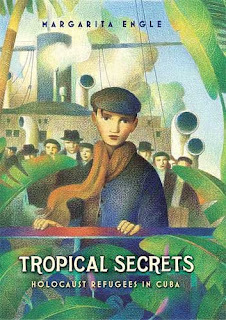 - Tropical Secrets: Holocaust Refugees in Cuba, by Margarita Engle - I really enjoyed Engle's 2009 Newbery Honor book The Surrender Tree: Poems of Cuba's Struggle for Independence. This new book is also a novel in verse, and I'm definitely looking forward to it. - Sisters of the Sword, by Maya Snow. There's a new exhibit at the San Francisco Asian Art Museum about Samurai. 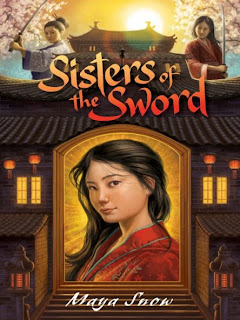 This sounds like an interesting historical fiction, about two girls who dream of being samurai in 13th century Japan. Booklist calls it the first in a "rousing new series." - The Young Samurai: The Way of the Warrior, by Chris Bradford. Another book that I'm checking out for the Samurai connection, this seems to be a very action-packed story about a young English boy who is the sole survivor on a merchant ship that is attacked by Ninja warriors. My 8 year old has recently gotten hooked by the Harry Potter series. She's just finished book 1, and is excited about the second book. It was so cute - she waited to finish the last chapter so that her dad could read it aloud with her tonight. My 5 year old daughter has been enjoying the Mercy Watson series, so we'll pack a few of those, along with several picture books like 10 Minutes Til Bedtime. I'll try to check in a few times when we're away - let us know what you're enjoying for your summer reading! 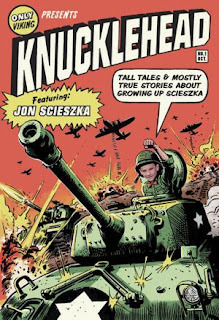 If you like funny books, and I seem to be on a funny book spell right now, you MUST check out Knucklehead: Tall Tales and Almost True Stories of Growing up Scieszka , by Jon Scieszka. This is a truly laugh-out-loud, every chapter sort of book. It's the sort of book that will have kids wanting to look inside from just the cover, and have them clutching their sides from laughing too hard. And all this, with an autobiography - that stodgiest of forms (NOT!). Jon Scieszka has written over two dozen children's books, ranging from The True Story of the Three Little Pigs to The Time Warp Trio series. In Knucklehead, he writes about his own childhood - what it was like to grow up as one of six boys in Flint, Michigan in the 1950s and 1960s. Each short chapter tells a different family story. These stories are hilarious - about all the trouble six boys will get into. I loved one teacher's comments after reading a few chapters aloud to her class: "
When I read a few chapters aloud to my students, they were literally in hysterics. There were shouts of, “I’ve done that!” and “My mom would flip out if she knew I did this stuff, too!”. It especially seemed to connect with boys but I had quite a few girls ask to get on the waiting list, too." (see The Reading Zone for her full review). Of all the Scieszka brother memories, I believe it was a family car trip that gave us our finest moment of brotherhood. We were driving cross-country from Michigan to Florida, all of us, including the family cat (a guy cat, naturally), in the family station wagon. Somewhere mid-trip we stopped at one of those Stuckey's rest-stop restaurants to eat and load up on Stuckey's candy. We ate lunch, ran around like maniacs in the warm sun, then packed back into the station wagon—Mom and Dad up front, Jim, Jon, Tom, Gregg, Brian, Jeff, and the cat in back. Somebody dropped his Stuckey's Pecan Log Roll on the floor. The cat found it and must have scarfed every bit of it, because two minutes later we heard that awful ack ack ack sound of a cat getting ready to barf. The cat puked up the pecan nut log. Jeff, the youngest and smallest (and closest to the floor) was the first to go. He got one look and whiff of the pecan-nut cat yack and blew his own sticky lunch all over the cat. The puke-covered cat jumped on Brian. Brian barfed on Gregg. Gregg upchucked on Tom. Tom burped a bit of Stuckey lunch back on Gregg. Jim and I rolled down the windows and hung out as far as we could, yelling in group-puke horror. All in all, Knucklehead has everything that you'd want in summer reading for kids who might be a bit reluctant to pick something up: lots of laughs, body humor (just ask them about "crossing swords"), funny pictures and short chapters. Find it at your local public library, an independent bookstore near you, or Amazon. It's summer and everyone's busy. So I've extended the Horrid Henry giveaway until Sunday, June 28th. For more details see here. This is a great chapter book for kids moving up to chapter books - perfect for kids who are comfortable reading a short chapter, but want a picture with each chapter. Better than that, it's perfect for kids who want silly antics and goofy situations. 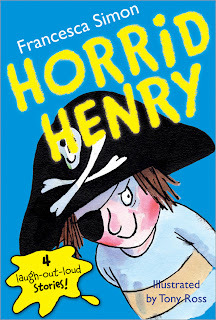 Courtesy of the publisher, I have four of the Horrid Henry books to giveaway. Winners will be drawn by random number generator. Tell your friends! Our five year old is starting to show interest in reading. But regular picture books have too many different types of words for her to tackle, so they end up frustrating her. What should you look for in a book for beginning readers? It should have words that are simple to sound out, but they should also be funny so kids want to keep reading. Here's a series that we love: Now I'm Reading! Playful Pals, Level 1 . It's fun but also easy for beginning readers to read successfully. Now I'm Reading! books are little CD sized binders with 10 very short stories each. 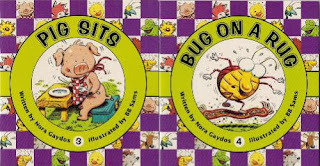 Each story focuses on a different sound: Rat Naps for the short a, Pig Sits for the short i sound, and Bug on a Rug for the short u sound. They also introduce common sight words like on, is & and. These are the building blocks your child needs to be able to read more varied picture books. After reading one story, your child can put a sticker on that story - a very exciting moment. Emily is so excited that she can read the first story that she almost leaps at any adult walking in the door asking if she can read them a story. The best thing about these stories is that the illustrations and stories are funny, without being cutesy. They'll appeal to boys and girls, and they'll also appeal to older kids who are working to learn phonics. They have clear story lines (a beginning, middle and end) - so kids read to understand the silly story, not just hear the words. If you like these stories, check out the others in the series: Animal Antics is another Level 1, Amazing Animals is Level 2, Snack Attack is Level 2, and On the Go is Level 3. What I really want to get for summer fun: Rhyming War! (Now I'm Reading! Games) It's new last summer and doesn't have any reviews on Amazon yet. But we love playing games, and rhyming skills are so important to early reading. These are really books to have at home, so you can put your own stickers in them. Find them at your local independent bookstore or Amazon. Kids love comics. They're full of laughs, and they're easy to dip in and out of. The Calvin and Hobbes books in our library get tattered to shreds, they are so well-loved. I love to use kids' love of comics to pull them into a book. Bruce Hale's new book, The Prince of Underwhere, does exactly this. It's half-comic book, half-chapter book, much like Captain Underpants books. Zeke, his twin sister Stephanie, and his best friend Hector are walking home one day when they start noticing some weird stuff going on. Their cat drops a mangled lizard at their feet, and seems to be almost talking to them, and a little while later it brings a seriously deformed bird home in its mouth. The cat is definitely trying to tell it something. When they chase the cat into the construction project down the street, they tumble down a dark opening and fall down a big, black hole. Welcome to Underwhere, land of midgets, dinosaurs and zombies. In this land, the three friends meet the local residents, who declare Zeke to be the prince whose coming was foretold in the Book of Booty. They honor him with a twenty-one bun salute (bowing the wrong way), and tell him that he must save them from the cruel Underlord. This book will draw kids in and make them laugh. I liked the conflicts and twists that developed. I'd say it's a good choice for 3rd graders - the vocabulary is not for kids new to chapter books. It would make a good choice for kids who liked Captain Underpants and are looking for other comic books. Find it at Amazon, or your local public library. When kids are learning to read chapter books, it's important that there are immediate rewards. They have to understand the story, the characters, the situation. But laughter is the best reward of all. 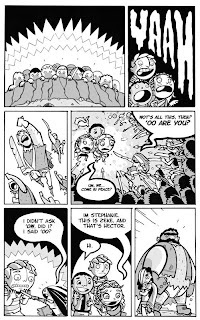 Horrid Henry , by Francesca Simon, is a new series in the US that is sure to find a good following among 1st and 2nd graders who want to move up to chapter books. Would you like a free book? See the contest at the end of this post! Henry is an ornery little boy - he's always causing trouble, and his parents expect him to. In fact, his brother is nicknamed Perfect Peter. Until one day, Henry decides that he's the one who should be perfect. Peter can't stand this, and starts acting out in all sorts of ways. Eventually, he throws his dinner at Henry (who naturally ducks), and the dinner lands straight on their mother's face! This is the first chapter in Horrid Henry, and it certainly made me laugh. The Horrid Henry chapter books are broken into four short chapters that pretty much stand alone. Each set of pages has a small illustration that adds to the laughs and keeps the readers connected to the silly situations of the stories. This will definitely appeal to reluctant readers. While I wasn't immediately taken with this mischievous boy, every child I've shown it to has immediately wanted to read it. That's a pretty good result. This will appeal to kids who like naughty stories, who like mischief, and who want a quick read. If they zoom through this first book, there are more: Horrid Henry's Stinkbomb , Horrid Henry Tricks the Tooth Fairy , and Horrid Henry and the Mega-Mean Time Machine . To celebrate summer reading, I have four Horrid Henry books to give away, thanks to the kindness of the publisher Sourcebooks. If you would like a Horrid Henry book for your little mischief maker, leave a comment or send me an email. In your comment, let me know a favorite funny book that your kids enjoy reading. If you are or become a follower, let me know and that counts as an extra entry! Contest ends on Monday, June 22nd. Remember to leave your email address, please! **UPDATE: GIVEAWAY EXTENDED to Sunday, June 28th! For an extra entry, follow Great Kid Books through email updates, Facebook, or RSS feed. Let me know either through email or the comment page. To read a chapter, see this excerpt from Horrid Henry Tricks the Tooth Fairy. Find Horrid Henry at your local independent bookstore, Amazon, or public libraries. Summer reading - what do you like? Personally, I like a combination of books: riveting adventures and quick heartfelt friendship stories. Sonya Sones is a great author for young teens who like heartfelt, real stories about friends. 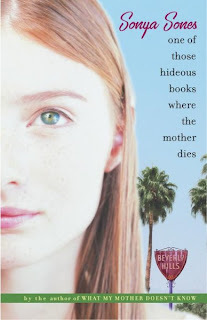 For the young teens in your life, I'd highly recommend One of Those Hideous Books Where the Mother Dies. Don't let the title turn you off - this is a great story about a young girl coming to know her dad after her mother dies. NY: Simon & Schuster, c2004. 268 p.
This book starts with Ruby on an airplane, leaving all that she knows behind, to go live with her dad, Whip Logan - an all-star movie actor, and in Ruby's eyes, an all-star jerk. Ruby's mother has just died of cancer, and now she must move across the country to LA to live with her dad whom she's never met. He says it like he's rehearsed it. But he says it like he means it. Like he really, really means it. so what if he does? the toughest role he's ever had to play. Ruby longs for her mother, her boyfriend and her best friend. She pushes her father away at every chance she gets. Having turned her grief into anger, Ruby spends most of her time either criticizing her father or writing desperate emails to her boyfriend, best friend and dead mother. But slowly, she starts dealing with her new school, making a few friends, and realizing things about her dad. Sones' novel is written in free verse poetry, and is a quick satisfying read. Teens will definitely like how this tells Ruby's story from her point of view. It's a combination of unrealistic Hollywood tale, and authentic exploration of overcoming grief. Ruby's voice is sharp and witty, and at points made me laugh out loud. As a mom, I'd want to know that this book doesn't get into the details of how Ruby's mom died, but it does show Ruby longing for her boyfriend and wanting to explore her sexuality with him. This is a book that will hook young teens looking for a satisfying summer read. It would make a great book to talk about together, as it explores issues of grief, sexuality, and family. But I would definitely say it's for grades 7 and up. Find it at your local independent bookstore, Amazon or public library. The last days of school are upon us. We'll love not having some extra space in our lives. Sure, summer is full with camps and activities. There's a little extra pressure on parents to entertain, supervise and shuttle kids. But there are wonderful opportunities for play, fun and relaxing. Given all that summer does bring, how can you encourage your children to read during the summer? 1) Make time to read. With all the activities in the summer, it's important to set aside time for our children to take it down a notch and read. Kids won't always do this themselves - it's a structure that often we, as parents, need to make. Whether it's in the evening or the early mornings or afternoon, set aside time to read. 2) Give your child choice about what to read. One of the joys of summer is not having the structure of school assignments. Kids are much more likely to get engaged with reading if they have a choice. But parents need to help provide a good selection for kids to browse through. 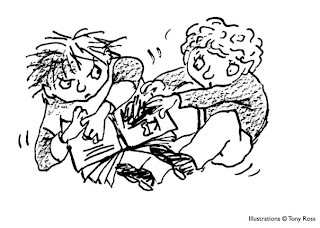 Take a trip to the library together, and bring home a big stack of books from the library - ask for suggestions from the librarian - try something different from an author your child has liked - when kids have playdates, ask your child's friends what they've liked reading and write down the titles. 3) Try audiobooks. Before you go on a family trip, get some audiobooks to try as a family. You can either download these to your iPod or MP3 player, or check out CDs from the library. These are a great way to bring families together. My eldest daughter (now age 10) loves to draw and listen to stories. Other children I know like to build Lego's while they're listening to stories. 4) Turn off electronics. We have a new rule this summer: no electronic games, video or TV before 5pm. It's an easy rule - no questions or grey lines. It gives the kids time when they get their fun, but also has them know that there are times they need to stretch their creative solutions to the "I'm bored" whining. 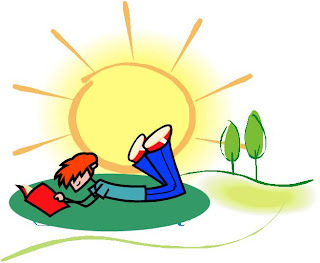 Do you have suggestions for how to encourage summer reading? Let me know - I'd love to share more ideas. Congratulations to Tara at Raising Itty-Bitty Bookworms! She's the winner of our first giveaway. 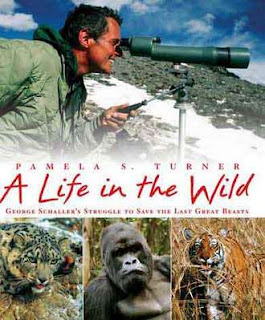 She will receive a copy of A Life in the Wild: George Schaller's struggle to save the last great beasts, by Pamela S. Turner. This is a compelling biography of George Schaller, a leading field biologist who studies many different wild animals in their native habitats. Tara will definitely enjoy it. She said, "I know my nine year old would be too excited about it. Her dream is to one day become a vet at a zoo." This book is about how you can have a passion as a young person and develop it into a meaningful scientific career. Anyone interested in nature and the environment should also check out Pamela Turner's upcoming book, The Frog Scientist. It's a fascinating look at the work of Tyrone Hayes, a biologist who studies the environmental impact of pollution and pesticides on frog populations. I picked the winner using Random.Org's random number generator. A copy will be in the mail shortly. Father's Day is coming soon. Here is a special book about a little girl getting to know her dad who lives far away. It's a great book to share about a father bonding with his daughter; it's also good to share about families with divorced parents. NY: Roaring Brook Press, 2008. Molly is a little girl with lots of energy and imagination. Whenever the kids at school talk about their dads, she wonders what her dad is like and makes up stories. You see, her dad "lives a whole plane ride away." But one day, Molly's mom has to go on a trip and her dad comes to stay with her. He's exhuberant, full of energy and silliness - but Molly is a little wary. "Hello my little Mollymaloola!" he cries; "My name is Molly," is her terse reply. Kids I've read this to like the way Molly discovers what she loves about her dad, and how they can be silly together. It made them think about how much they love their dads, how they like trying on his clothes and being silly with them. 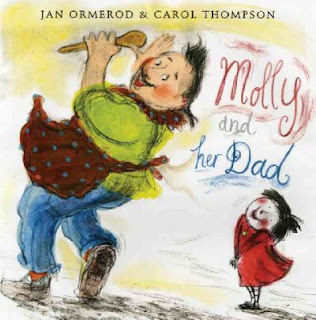 The kids I read it to had a little trouble understanding why the dad lives so far away, but they understood Molly's feelings - first of apprehension when her dad came to stay with her, and then pride when he told stories to her class, and finally joy with her love for her dad. This is a great story to share and talk about dads and how families can live with parents separated in different places. Many thanks to Mrs. Dalloway's Bookstore in Berkeley for helping me discover this book and read it to a preschool class. They have a wonderful selection of children's books. Well, the weekend is over and I've read 3 new books. On total, I read for 9 1/2 hours. Not bad for a weekend full of family events - dinner with my parents, sleepover party for 7 girls, music recital at my house. The Evolution of Calpurnia Tate , by Jacqueline Kelly. While I found this a bit slow to get into, I did appreciate its sense of wonder at the natural world and astonishment at what the future will bring. One of Those Hideous Books Where the Mother Dies , by Sonya Sones. I thoroughly enjoyed this book in free verse. It was light, but thoughtful. A bit predictable, but kept me wanting to know what happened next. And I discovered that while my 10 year old would like to read this, it definitely belongs in the too-YA for her shelf! 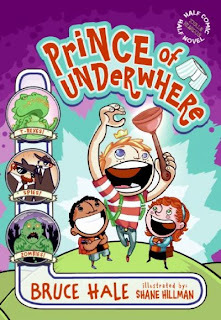 Prince of Underwhere (Underwhere Series) , by Bruce Hale. A fun way to wrap up the weekend. I do think that 3rd and 4th graders will enjoy this. It is a graphic novel / chapter book combo. It has potty humor that took me a while to get (the great Lump of Pu). Plus classic good vs. evil story. The best news: I discovered new friends and blogs, and I want to keep reading more! I'm excited about my quest for this summer: digging into middle school (grades 6 - 8) reading. So if you have any great suggestions for this level, send them my way! Ooh, a perfect weekend? Some sunshine, a little escape and sinking into some good books. 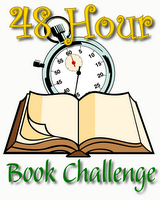 This weekend, I'm participating in the 48 Hour Book Challenge. The basic goal is to see how much time I can devote to reading over 48 hours. Yes, of course I have to fit this in amongst hosting a sleepover, fixing breakfast for nine, and hosting a music recital at our house. But for as much of the weekend as I can, I am going to ESCAPE and READ! Periodically, I'll update this entry to quickly note what I'm reading. But I'll wait until Sunday night to write in more detail. Cheers - here's to some lovely time away from everything else! Friday night - read from 10:00 - 10:30 - The Evolution of Calpurnia Tate. Fell asleep much too early. Oh, my daughter's sleepover party and library inventory wiped me out. Saturday - read from 10:00 - 1:00 - continued with The Evolution of Calpurnia Tate, but found it a bit slow. Then I started One of Those Hideous Books Where the Mother Dies by Sonya Sones, which is much better pacing for my mood right now. It's full of teen attitude and sarcasm. Of course, my plan for a full escape kind of fell to the wayside as I handle 3 kids doing fuse beads in the house... More reading soon. read from 2:00 - 4:00 - finished One of Those Hideous Books Where the Mother Dies and decided that it was definitely, definitely too YA for my 10 year old. Then picked up The Evolution of Calpurnia Tate again. Off to the library with my eldest daughter, then dinner & family dinner. Sunday morning - glorious morning - everyone slept in! I was able to read from 8:00 - 9:00. Picked up a fun younger novel that I'd been wanting to get to: The Prince of Underwhere, by Bruce Hale. Now off for our crazy day. Hopefully I can squeeze in some more reading before my 10pm deadline. Sunday evening - finished The Prince of Underwhere, by Bruce Hale. Enjoyed it, in a sort of 3rd grade way. Not my favorite thing, but enjoyable. Torn between digging into my next book (Gone, by Michael Grant) or catching up on some blogging. The good news is that this weekend has made me itch for more reading time. It's also made me realize that when I'm trying to read a lot, I definitely like a strong plot to pull me through. I know that characterization is important, but I like good conflict and motive to draw me into a story. Are you planning a car trip this summer? Or maybe you have a reluctant reader and want to hook them into some good stories. Try listening to audiobooks! Middle grade readers in 3rd – 5th grades especially enjoy longer fantasy books with action and more complex plots. I especially like both of these books because they are the first in a series. If a child gets hooked on the characters and suspense, they will want to read others in the series. Gregor is drawn into a magical world underground, as he follows his 2-year old sister when she is sucked down an air vent in the basement of their New York apartment building. 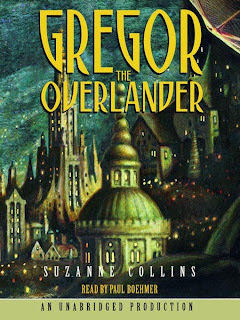 Gregor and his sister, Boots, enter the world Underland - with giant cockroaches, bats and rats. Gregor meets the people of the Underworld, and learns that his journey their was prophesied hundreds of years ago. He is sent on an epic quest in search of his missing father, who is being held captive by the evil rats. There is adventure and fighting, friendship and discovery. I was really drawn into this audiobook as Gregor searched for his father and cared for his little sister, in this strange and dangerous world. You can read the first chapter of Gregor the Overlander on NPR's website. Sabrina and Daphne Grimm are orphans who must solve crimes in a town where fairy tales are real. The two sisters are sent to live with their grandmother, who tells them that they are descendants of the famous Brothers Grimm. A mystery ensues when people start disappearing with a red hand print left at the scene of the crime. Sabrina and Daphne must help solve the mystery when Granny Relda disappears, too. I agree with the School Library Journal review: "Readers well grounded in their fairy tales will get the most pleasure from recognizing the characters–Prince Charming, Jack-the-Giant-Killer, the Three Pigs, the Magic Mirror, and more–but the fast pace, sly humor, and cleverly inserted vocabulary lessons will entertain even those who are meeting the characters for the first time." I must admit, I have not listened to this whole story. It's rare that I recommend a book that I haven't read or listened to in its entirety. 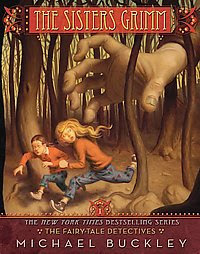 But my two daughters, ages 7 and 9, were so hooked by this audiobook that I have to recommend it. We listened to it (for free) through NetLibrary.com - available through our local public library. They were so enthralled that they spent hours listening and reading to the rest of the series. I wasn't able to get on audio the whole series (at least, that's what I told my daughter), so my 9 year old started reading the series. Audiobooks can be the perfect hook. This is not high-quality literature, but it's exciting and fun. 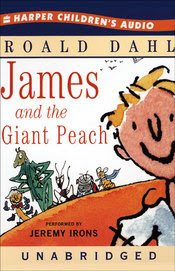 James escapes his wicked aunts with the help of magic crystals and enters the magical world with the insects. This reading is so much fun. Jeremy Irons doesn't just read the story - he performs it, bringing laughter and hillarity throughout. I'll never forget Aunt Sponge and Aunt Spiker arguing while James had to do all the work around the house. Once he ventures inside the peach, he finds friends and a real role as a hero in this exciting adventure. For a sample, you can go to Audible.com or the HarperCollins website. Both of these audiobooks are easily available at your local library on CDs or tapes, through Amazon or to download via www.Audible.com. Happy listening! Audible.com: www.audible.com has a vast collection of audiobooks, for children and adults. Audiobooks for children cost between $10 and $20, depending on the length. While this might seem expensive, I would argue that $15 for 7 hours of entertainment is good value, especially if it can develop a love of books. I’ve found the downloading and listening process through Audible.com a smooth experience. You can either download Audible software, or access your files directly from iTunes. The best feature of the Audible books is that my MP3 player automatically remembers where I paused listening to my book. Even if I listen to music or another podcast, when I go back to my book - it remembers! I've even found that I can skip or rewind by chapter. You don't have to keep all your audiobooks on your MP3 player - the Audible site keeps your library for you. They have an extensive selection for kids and young adults - you can either search on their main Audible site, or you can also search on Audible Kids. You may notice that when you buy some audiobooks through iTunes that they are actually an Audible.com production. You might want to compare prices between iTunes and Audible - I've heard that Audible is much less expensive. NetLibrary: At www.NetLibrary.com, you can get a free (yes, free!) membership through many local public libraries. The best way to navigate to their site is through your local public library - that will prompt you to enter your library card and give you a free membership. On the Oakland & Berkeley public library websites, look for “online resources”. Follow the links to e-audiobooks. Through NetLibrary, you can download and “checkout” MP3 files for three weeks. You then transfer the files to your MP3 player, or just listen to them on the computer. Unfortunately, only some files work with iPods. If you are an iPod user, look for files that have the MP3 label on them. These will work to transfer to your iPod. NetLibrary is acquiring mroe and more audiobooks that will work with iPods. The biggest drawback is that you can’t save your place on these files if you listen to music after listening to a chapter of your book. One of our MP3 players (the Creative Zen) allows us to "bookmark" a place on a song or file. So each time we listen to an audiobook, we bookmark the spot when we finish. Then it's easy to begin again at the same spot. Otherwise, you have to write down the place you finished (minutes) and fast forward to this spot again. Overdrive: Overdrive Media also provides free, easy access to downloadable audiobooks through many local public libraries. In the Bay Area, San Francisco Public Library and MarinNet public libraries subscribe to Overdrive. The best way to navigate to their site is through your local public library - that will prompt you to enter your library card and give you a free membership. San Francisco Public Library's website has a link for e-media right at the top. Using Overdrive, I was able to download The Sea of Monsters, by Rick Riordan for my daughter in 15 minutes - from start to finish. It was a smooth, easy process. I started at 7pm, and by 7:15 she was listening to her story! Overdrive has titles from Listening Library, Books on Tape, BBC Audio, and more. For example, you can get the Twighlight series on audio through Overdrive (at 15 hours per book!). Once again, the software does not automatically save your spot and you do need to look to see if your title is iPod compatible (again, it will be marked "MP3"). But I just noticed that The Kabul Beauty School is available (iPod compatible), and have added this to my wish list. I love free audiobooks! Have fun, and let me know if you have any luck downloading audiobooks. I'm always looking for good books to listen to!